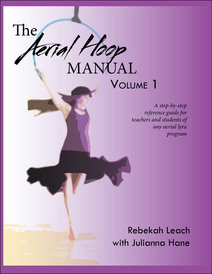 In this first volume of the Aerial Hoop Manual series, you will find over 600 pictures to help depict over 50 families of moves which are explained through detailed step-by-step instructions. Students will gain an understanding of where the content fits into the big picture of aerial hoop. Teachers will be assisted in learning how to properly teach progressions, grip choices and much more. 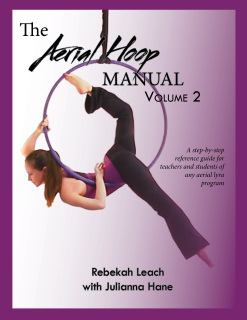 The Beginning Aerial Fabric Instructional Manual was written by Rebekah Leach, after years of experience teaching beginning aerial silks students. This manual includes step-by-step detailed directions with over 40 moves, as well as hints and helpful suggestions on how to avoid common mistakes. There are over 250 colored pictures to help guide you through beginning moves. This book is the first of its kind to provide such in-depth descriptions of the movements. This monster was too big to fit in just one book - I had to break it down into two parts, but each part is plenty to chew on for a whole course in and of itself. The manual (as well as it's counterpart, which is coming soon) is full color with descriptions of over fifty moves and their variations. It is jam-packed with good stuff to chew on, including quizzes to test your knowledge! 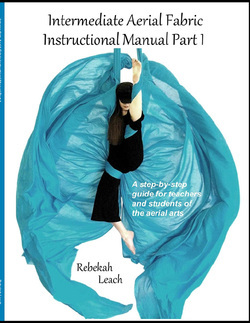 If you are a teacher of student of aerial arts, this book is a must-buy for you. It includes an article on "moves classification theory" which will open your eyes to the way you view fabric art; it will help you to build a solid foundation so that when you learn a new move, it can be done in an organized way, not a half-hazard list of moves. Just like nearly every book Rebekah has written, this manual has full color pictures at every step to describe more than fifty moves and their variations. Part 2 includes step-by-step details of various drops as well as over 30 moves and how to start connecting ideas. This is a great reference for those who are just starting to work with drops on the fabric, as well as for those who are interested in choreography, and how the various fundamental ideas of fabric can be applied to new knots. 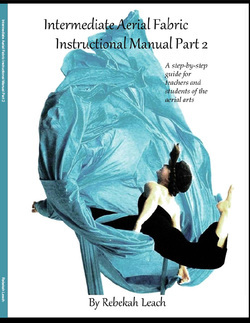 With over 300 pictures (unfortunately, the aerial yoga series is not in color, but the black and white is still awesome), this step-by-step manual gives detailed descriptions on every move. There are bonus sections entitled "Body Awareness" which highlight the key alignment focuses of each movement so that you are executing moves safely, and getting more out of every move. 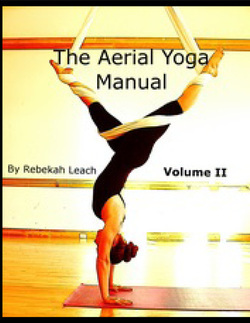 Beginning inversions and flying poses are all in this first volume. Covering more than fifty moves, this is the second and slightly more advanced volume in the Aerial Yoga series. With detailed descriptions and pictures at every turn, moves such as handstands, back arch poses, and planks are explained step-by-step. Teachers and students alike will enjoy adding this manual to their resource library.